NADH response was measured with Amplite™ Fluorimetric NAD/NADH Ratio Assay Kit in a 96-well solid black plate using a Gemini microplate reader (Molecular Devices). Nicotinamide adenine dinucleotide (NAD+) and nicotinamide adenine dinucleotide phosphate (NADP+) are two important cofactors found in cells. NADH is the reduced form of NAD+, and NAD+ is the oxidized form of NADH. It forms NADP with the addition of a phosphate group to the 2' position of the adenyl nucleotide through an ester linkage. NADP is used in anabolic biological reactions, such as fatty acid and nucleic acid synthesis, which require NADPH as a reducing agent. The traditional NAD/NADH and NADP/NADPH assays are done by monitoring of NADH or NADPH absorption at 340 nm. This method suffers low sensitivity and high interference since the assay is done in the UV range that requires expensive quartz microplate. Our Amplite™ NAD/NADH Ratio Assay Kit provides a convenient method for sensitive detection of NAD, NADH and their ratio. The enzymes in the system specifically recognize NAD/NADH in an enzyme cycling reaction. There is no need to purify NAD/NADH from sample mix. The enzyme cycling reaction significantly increases detection sensitivity. In addition, this assay has very low background since it is run in the red visible range that significantly reduces the interference from biological samples. The assay has demonstrated high sensitivity and low interference with Ex/Em = 540/590 nm. This Amplite™ Fluorimetric NAD/NADH Assay Kit can be performed in a convenient 96-well or 384-well microtiter-plate format and easily adapted to automation with no separation steps required. It is highly recommended to incubate the cells with Lysis Buffer (Component G) at 37oC and use the supernatent for the experiment. Add 200 µL of PBS buffer into the vial of NADH standard (Component C) to have 1 mM (1 nmol/µL) NADH stock solution. 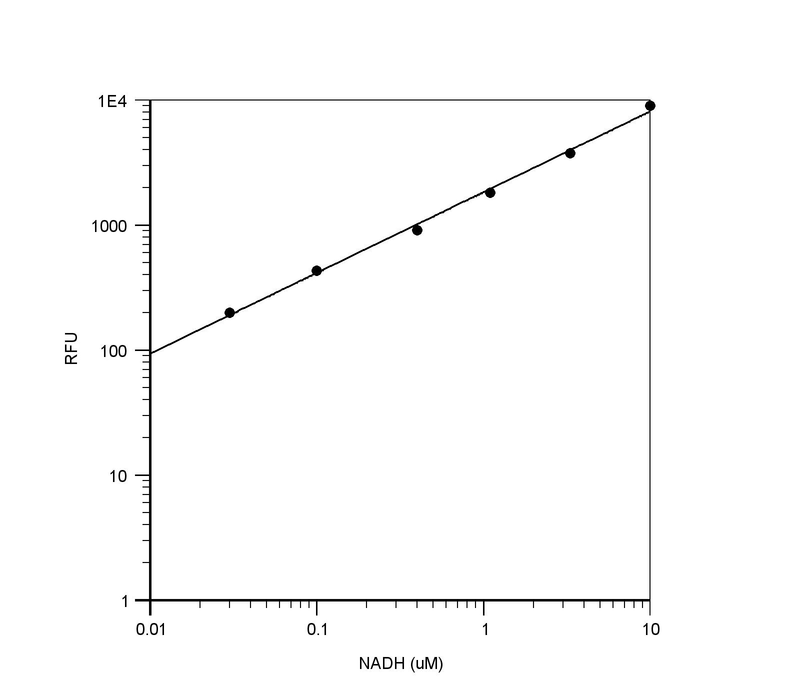 Use NADH standard solution and PBS buffer (pH 7.4) to generate 30 µM (30 pmols/µL) NADH standard solution (NS7). Then take the 30 µM NADH standard solution to perform 1:3 serial dilutions to get remaining serially diltued NADH standards (NS6-NS1). Note: Diluted NADH standard solution is unstable, and should be used within 4 hours. Add 10 mL of NADH Sensor Buffer (Component B) to the bottle of NAD/NADH Recycling Enzyme Mixture (Component A), and mix well. Note: This NAD/NADH working solution is enough for two 96-well plates. The working solution is not stable, use it promptly and avoid direct exposure to light. Table 1. Layout of NADH standards and test samples in a solid black 96-well microplate. NS = NADH standard (NS1-NS7, 0.03 to 30 µM); BL = blank control; TS = test sample; TS(NADH) = test sample treated with NADH Extraction Solution, then neutralized by NAD Extraction Solution ; TS(NAD) = test sample treated with NAD Extraction Solution , then neutralized by NADH Extraction Solution. Table 2. Reagent composition for each well. Take note that high concentration of NADH (e.g., >300 µM, final concentration) may cause reduced fluorescence signal due to the over oxidation of NADH sensor (to a non-fluorescent product). Incubate at 37oC for 10 to 15 minutes. Prepare NADH standards (NS), blank controls (BL), test samples (TS), test samples treated with NADH Extraction Solution (TS(NADH)), and test samples treated with NAD Extraction Solution (TS(NAD)) according to the layout described in Tables 1 and 2. Note: Prepare cells or tissue samples as desired. Note: Incubate the cells with Lysis Buffer for 15 mins at 37oC and use the supernatant for the experiment. For NAD Extraction (NAD): Add 25 µL of NAD Extraction Solution (Component E) into the wells of NAD/NADH containing test samples. Incubate at 37oC for 10 to 15 minutes, then add 25 µL of NADH Extraction Solution (Component D) to neutralize the NAD extracts as described in Tables 1 & 2. For Total NAD and NADH: Add 25 µL of NAD/NADH Control Solution (Component F) into the wells of NADH standards and NAD/NADH containing test samples. Incubate at 37oC for 10 to 15 minutes, and then add 25 µL of Control Solution (Component F) as described in Tables 1 and 2. For NADH Extraction (NADH): Add 25 µL of NADH Extraction Solution (Component D) into the wells of NAD/NADH containing test samples. Incubate at 37oC for 10 to 15 minutes, then add 25 µL of NAD Extraction Solution (Component E) to neutralize the NADH extracts as described in Tables 1 & 2. Note: In healthy mammalian cells, there is more NAD compare to NADH, so one can simply use total NAD and NADH minus the NAD to calculate the amount of NADH. Add 75 µL of NAD/NADH working solution into each well of NADH standard, blank control, and test samples to make the total NADH assay volume of 150 µL/well. Incubate the reaction at room temperature for 15 minutes to 2 hours (We tested 60 minutes in the figure shown), protected from light. Monitor the fluorescence increase with a fluorescence plate reader at Ex/Em = 540/590 nm (cutoff 570 nm). Note: The contents of the plate can also be transferred to a white clear bottom plate and read by an absorbance microplate reader at the wavelength of 576 ± 5 nm. However, the absorption detection has lower sensitivity compared to fluorescence reading. Figure 1. NADH response was measured with Amplite™ Fluorimetric NAD/NADH Ratio Assay Kit in a 96-well solid black plate using a Gemini microplate reader (Molecular Devices).